Nigel and I came up with this idea to get these dog tags made – similar to a sobriety chip – to show the day our mental health recovery journey started so as to act as a reminder about just how far we each have come. It includes our personal message/mantra to ourselves – mine was ‘its ok’. So here it read – ‘Dec 28, 2012’ – The day I was first hospitalized for mental illness. The day I just wanted someone to understand. The day I wanted someone to say its ok. A safe place. The day that marked the beginning of my mental health recovery journey. I was only in the hospital for 24 hours, and released. I wasn’t in “crisis” anymore that I needed emergent care, but I was still in a form of crisis. I needed help, and as many others have been, I was put on a waiting list – it would be over a year before I would get diagnosed and accepted into the right therapy program. So now what do I do with this very heavy and very confusing mental illness cloud hanging right over top of me – that no one understands – even I didn’t understand. I was never in art. I was a figure skater – and I was in band. I couldn’t draw a stick figure to save the life of me … actually, I still can’t draw a stick figure … but I digress. As my mental illness continued to ebb and flow in the hardest of ways, someone told me about this program called Artbeat. I decided to look into in, and just as the stars align when we need them to, my application was submitted just in time for interviews. What was I doing? I’m not an artist. But let me tell you – that is one just one of the beautiful things about Artbeat – it’s not so much about talent and what you produce – it’s about the journey. Artbeat helped me find myself in a way I never knew I could – that gave me a confidence to continue to push through in my mental health recovery. So, I was accepted into their fall 6-month residency program. Six months. I was having a hard time seeing tomorrow, never mind months in advance, but Nigel and Lucille had this way of helping keep me in the present – to just try my best. For the first time in my life, mental health and illness didn’t seem taboo. I didn’t have to lead with it. I didn’t even have to discuss it if I didn’t want to because I felt that I was ok to just be me. Its ok. I had found my safe place. Part of my illness plagued me with overwhelming negative thoughts – that I was a bad person, and I had lost all sense of self love, and self-worth. Artbeat took me into their family, shared their space and love, and taught me how to explore art and about being an artist. I flourished in a way I didn’t think possible. I started to grow more confident as I discovered and grew this beautiful creative piece of my life. Artbeat helped me find myself in a way I never knew I could – that gave me a confidence to continue to push through in my mental health recovery. The exhibit came. The big day, and all my art. All my emotions were up on that wall. I essentially was on display for everyone to see me in a way that I used to feel embarrassed about. But remember mental illness doesn’t discriminate. It’s not your fault. You don’t choose it. And that night Artbeat helped me see that my mental illness was not a representation of me. I had never been that vulnerable before. It was a very powerful moment for me. But then it ended. And as most Alumni feel, I was scared. I was going to lose my safe place. My bubble. What. How. I didn’t know how I would be able to continue this on my own. Enter Studio Central. A place originally created solely for Artbeat Alumni to continue their mental health recovery at. But not only is it a very important extension of Artbeat for Alumni, it is a place that outside community can also participate in. It is a beautiful bridge that brings mental health workers, the general public, alumni, and community members struggling with mental illness or physical/mental disabilities together – in a way that you don’t have to enter into the conversation leading with a branding of what diagnosis you may or may not have. It is a central studio where creative endeavor brings everyone together – helping to make mental health just an average conversation topic. But I had a day job – so I couldn’t spend a lot of time at Studio Central because of the hours. I was trying to paint and continue that creative self-work at home, but I didn’t know what I was doing with the art. And it was starting to pile up. I didn’t know the first thing about selling art. Enter Upbeat Artworks. A place created for Artbeat Alumni to sell their work – to gain a new level of self-worth. Art as a vocation. A debilitating mental illness, a hard recovery that sometimes prevents some from ever being able to work again, but now they have a platform to earn some money. A way to build a new confidence in selling their work, through continual opportunities to be on display and exhibit through – not only at Upbeat, but through the online database of art being created simultaneously as well. I could continue to tell my story through my art on display at Upbeat. I felt I had come full circle in my mental health recovery journey because of the programming offered by Artbeat, Studio Central, and Upbeat Artworks. And now, I wanted to give back. I wanted to pay it forward. And I was so incredibly blessed to be presented the opportunity to become an Artbeat board member. Which I am so incredibly honoured, and proud to be a part of representing the Alumni family. As you can see, Artbeat helped in four very different ways to save my life. I would not be standing here without the Bart family, and especially without the Artbeat program and projects. My family thanks Artbeat. And I thank Artbeat from the bottom of my heart for helping me not only recover, but thrive, and thrive in a way I never knew possible. Help be a part of the story of saving lives and changing the face of mental health and illness. So, what can we do? I believe people will pay because they want their family and friends to be well. They want each person to be able to be the best they can be. And mental illness takes you away from your life – but it is programming like Artbeat that can change that. Help Artbeat save other lives as it has mine. Help be a part of the story of saving lives and changing the face of mental health and illness. Please, please donate. Yes, I will donate to Artbeat Studio! Please share this campaign with your friends and family and community – connect with us on Facebook and Twitter. 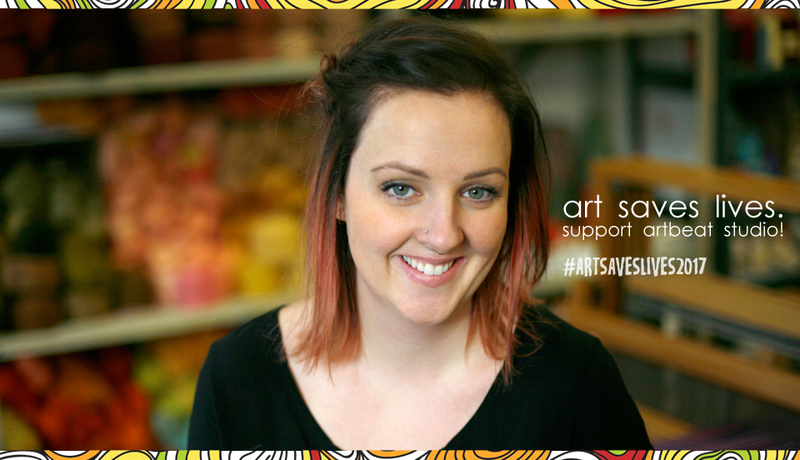 Interested in volunteering for the campaign to save Artbeat Studio? Email us at contact@artbeatstudio.ca.